Greenville’s Morgan Gilbert looks for an opening in the Stivers defense during a non-league game on Monday night. The Lady Wave won the game, 71-24. Greenville’s Haleigh Mayo-Behnken drives toward the basket around a Stivers defender during a non-league game on Monday night. The Lady Wave won the game, 71-24. 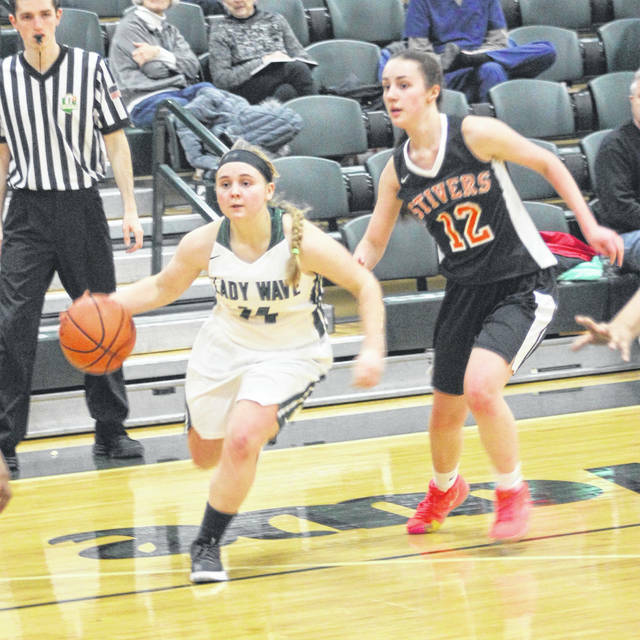 Greenville’s Chloe Sowry plays some defense against Stivers during a non-league game on Monday night. The Lady Wave won the game, 71-24. Greenville’s Koryann Elliott watches after she releases her shot during a non-league game with Stivers on Monday night. The Lady Wave won the game, 71-24. 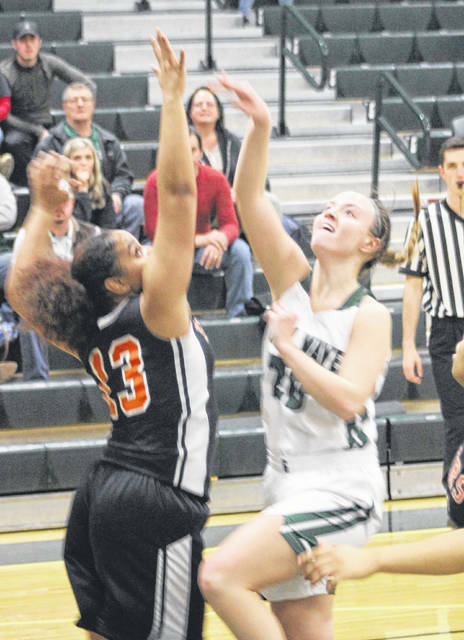 Greenville’s Libby McKinney sets up for a 3-point shot attempt during a non-league game with Stivers on Monday night. The Lady Wave won the game, 71-24. 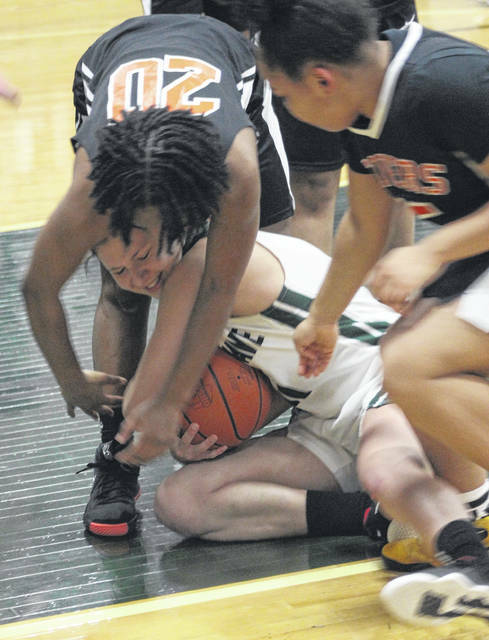 Greenville’s Natea Davidson wrestles for the ball with a pair of Stivers players during a non-league game on Monday night. The Lady Wave won the game, 71-24. Greenville’s Morgan Gilbert gets by Stivers’ Michaela Fleming (12) and drives toward the basket during a non-league game on Monday night. The Lady Wave won the game, 71-24. 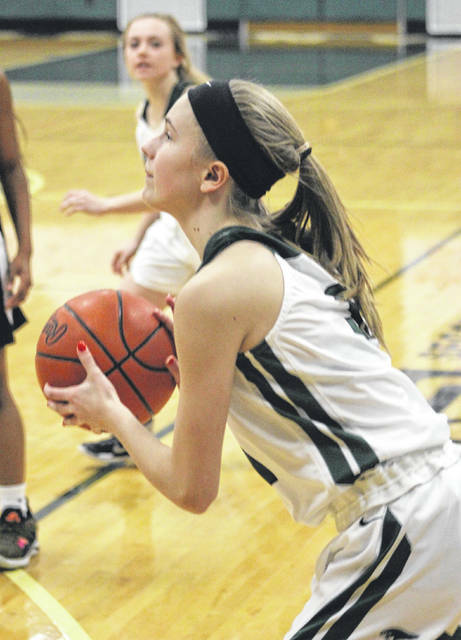 GREENVILLE – The win came at just the right time for the Greenville girls basketball team. 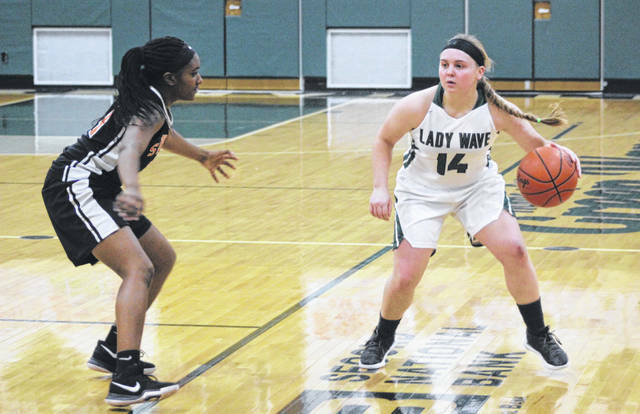 As the Lady Wave prepare for a difficult final stretch with games against Greater Western Ohio Conference stalwarts Vandalia Butler and Tippecanoe later this week, a win was a much needed confidence boost and that is exactly what they got in hosting Stivers on Monday night. Greenville (8-8) had four players score in double figures and routed the visiting Tigers 71-24. The Lady Wave, who have now won 3 of their last 4 games, poured it on early in jumping out to a 22-3 lead at the end of the first quarter and carrying that momentum to a 41-5 halftime lead. 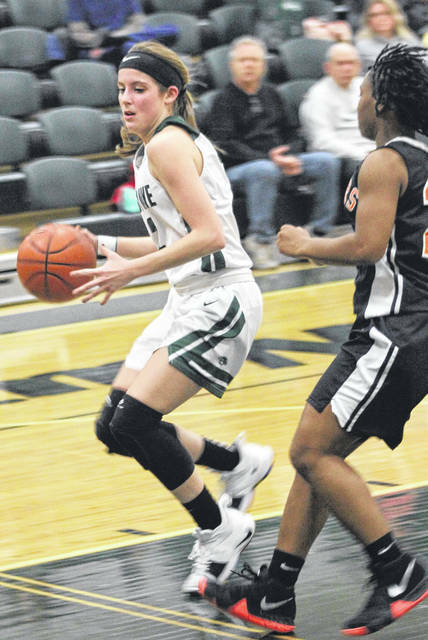 All 11 of the available players on Greenville’s bench played significant minutes and eight of them found the scoreboard led by junior Haleigh Mayo-Behnken with 16 points. She was followed by senior Jada Garland and sophomore Nyesha Wright with 12 apiece and senior Koryann Elliott with 11. Stivers was at its best in the third quarter when the Tigers scored 12 points, half of their game total. Already leading 41-5 to start the second half, Greenville opened with a 6-0 run that included a pair of baskets by junior Morgan Gilbert and then a deuce from Elliott at the 6:27 mark to make it 47-5. That’s when the Tigers finally found a spark. Kiarra Edley hit a pair of free throws followed by Arianna Williams and S. Jones each with a basket for a 6-0 run of their own. Garland stopped that run with a 3-pointer – her first of three in the frame – from the corner and a few seconds later Annie Hayes grabbed an offensive rebound and put it back in for a score and the Greenville lead was 52-11 with 3:07 to play in the third period. 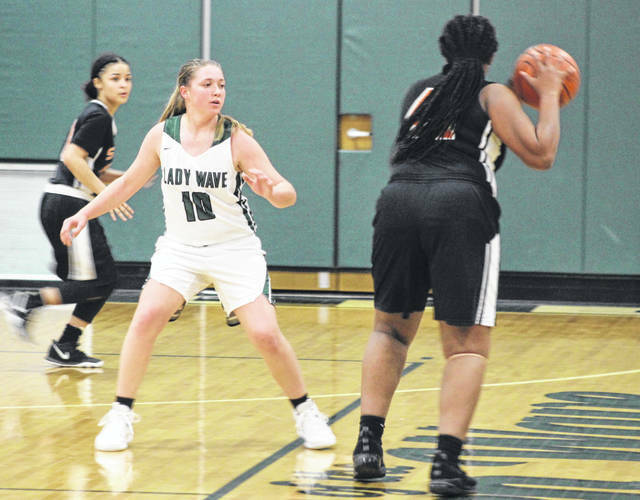 Williams then connected on back-to-back baskets for Stivers, but the Lady Wave closed out the final 1:37 of the third quarter with a 10-2 run to make the score 62-17 with one period to go. Garland had 6 points, Mayo-Behnken and Wright had 2 each in that run. Williams led the Tigers with 11 points, 10 of which came in the second half. Courtney Taylor added 5 for Stivers. Others to score for Greenville were Chloe Sowry with 7, Gilbert with 6, Hayes with 4 and Taylor Yates with 3. Greenville has five games remaining in the regular season the first of which is on Wednesday with a home game against Vandalia Butler. Tip off is scheduled for 7:30 p.m.
Stivers – Jaycey Phipps 0 2 2, Kiarra Edley 1 2 4, Courtney Taylor 2 1 5, Arianna Williams 5 1 11, S. Jones 1 0 2. Totals: 9 6 24. Greenville – Haleigh Mayo-Behnken 6 3 16, Nyesha Wright 6 0 12, Chloe Sowry 3 0 7, Morgan Gilbert 3 0 6, Jada Garland 4 0 12, Koryann Elliott 4 3 11, Annie Hayes 2 0 4, Taylor Yates 1 1 3. Totals: 29 7 71. 3-pointers – Stivers (none), Greenville 6 (Garland 4, Mayo-Behnken 1, Sowry 1). Records: Stivers (3-10), Greenville (8-8). JV score: Greenville 50, Stivers 18.